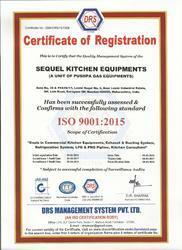 Established in the year 1990 , "Sequel Kitchen Equipments ( A Unit of Pushpa Gas Equipments)" is manufacturing and supplying of Commercial Kitchen Equipment and Utility Equipment. These gas kitchen appliance, commercial hospitality equipment are widely demanded by various hotels, hospitals, embassies, resorts, industries and educational, professional institutions. In addition, we also meet the requirements of cooling equipment, kitchen refrigeration equipment, commercial dishwashing equipment, kitchen exhaust system, exhaust hoods and L.P.G gas system including gas banks. Our range includes commercial hospitality equipment, catering kitchen equipment, commercial dishwashing equipment, kitchen refrigeration equipment, gas kitchen appliance, four burner range with oven, chapati plate with puffer, cold bain marie counter, masala trolley, kitchen storage racks, pizza oven, hot case counter, pot wash sink and island kitchen. All our commercial kitchen equipment are used for different purposes such as food preparation, cooking, frying, washing, refrigeration and storage. These commercial hospitality equipment, gas kitchen appliance are developed using stainless steel and other material, which ensures in them high durability standards. We also use innovative technology in its manufacturing, which is carried out by our experts, under the guidance of our owner Mr. Gorakhnath Salunkhe. He has tremendous experience in this domain, which enables us to acquire high repute in the segment of kitchen equipment. His process expertise enables us to also offer customized solutions to our customers for our range of equipment, in terms of sizes and finishes. We are one of the prominent manufacturer and supplier of Commercial & Industrial Kitchen Equipment. The expansive range of products offered by us includes Baking Ovens, Industrial Gas Burners, Dosa Plate, Idli Makers, Boilers, Tilting Boiling Pan, Sandwich Griller, Vertical Refrigerator, Tilting Braising Pan and Water Cooler. Designed and made by our skilled professionals, our products are made using quality material like stainless steel, procured from reliable vendors. Our products can be availed in various designs, sizes, materials and finishes, meeting diverse needs of the clients. By offering superior quality products to the clients, we have gained huge recognition in the markets. The range of Commercial & Industrial Kitchen Equipment offered by us is widely used in various industries. For their superior functioning and reliable operations, clients place repeated order for our products time-to-time. We are assisted by an adroit team of professionals. Wide recognition and phenomenal growth in this particular domain have assisted us in establishing a strong foothold in the national markets. It is due to their efforts that we have been capable of attaining a distinguished status in the respective domain. Keeping strict eye on production process, our professionals avoid any kind of delay in the delivery of consignment. Our professionals select the material from reliable sources and manufacture the products suiting differentiated needs of the clients. We are a leading manufacturer and supplier of Commercial & Industrial Kitchen Equipment located in Mumbai. We have garnered a rich list of clients across the country by following ethical business standards. With the dedicated efforts of our professionals, we have won accolades from the our clients. The success and growth of our company relays upon good manufacturing practices that are followed by executives and experts all. Our organization is among the best resource for the offered range of products. We are offering our products at most reasonable prices as per the specifications detailed by our clients. Apart from this, we assure safe and timely delivery of the offered products at client place. For the benefit of our clients, we are accepting multiple modes of payments. We have a team of highly skilled and talented professionals. These professionals have years of working experience in this domain. With the constant support and dedication of our employees we are able to cater the diverse demands of valued customers. To improve and enhance their skills as per the upgraded trends and developments, we provide essential training to our employees on stipulated period of time.